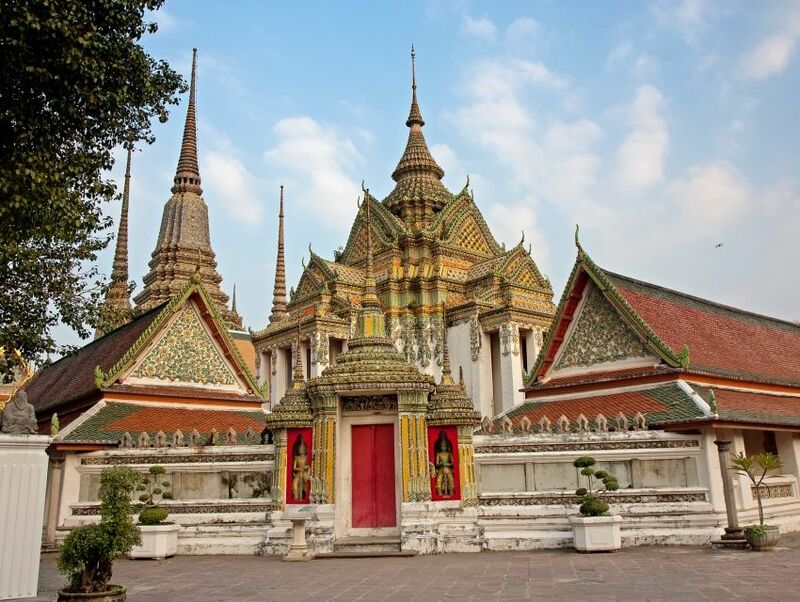 Characterized by a gleaming nexus of intricate spires that shoot upwards, and a spectacular sprawl of regional architecture, the iconic Wat Pho is counted among Bangkok's oldest temples. This royal temple was built by King Rama I on an erstwhile temple site, and while the original features of the temple are still exquisitely preserved, the temple underwent remodeling during the reign of King Rama III. The crown jewel of the stunning Wat Pho is the languorously reclining statue of the Buddha, stretching across 46 meters (150.9 feet) of glistening gold. Apart from the lifelike Buddha statue, the temple is also home to the most extensive collection of Buddha images, and one of Thailand's earliest hubs of religious education. Wat Pho boasts of a northern compound called the phutthawat, which constitutes some of the temple's most impressive buildings, including the one within which the Reclining Buddha is housed. The southern compound remains closed off to visitors, and comprises of a school and accommodation for resident monks. While many are aware that Wat Pho is a revered religious and educational symbol, few know of its association with the traditional practices of Thai massage. From 1955, the temple has been operating as a center for Thai medicine, besides also displaying endless plaques and inscriptions related to this traditional therapy within its vast complex.